In Venice, we didn’t have a plan, just a list of things to see and do in any order, on any day. That worked out well, because anywhere you go in Venice is an adventure. Our visit to Rome, on the other hand, is pretty well programmed. With so many things to see in the cradle of western civilization, a plan is a necessity; so I expect that visit will also work out well. In Florence, our strategy was more like Venice’s: a list of things to see, but no specific plan. Like Rome, however, there’s a lot to see here, so a more structured plan might have served us better. Things were complicated by the weather—cold and windy, with Renaissance-sized narrow streets acting like wind tunnels—by hordes of people who seem to mostly be Italian youths on school trips, and by the fact that most of the major sights here charge for entry. As a result, our sightseeing (at least by my overly particular standards) has been a bit disorganized. But don’t get me wrong: we had a great day, mostly focused around food. And though we’re surrounded by history, Italy is also well known for food, so there’s absolutely nothing wrong with how the day unfolded. We started out by trying to follow a Rick Steves audioguide tour through the historic center. But the cold, crowds and whims of a seven-year-old made it an extremely challenging endeavor. Things turned around, though, when we popped into a lovely little restaurant called FrancescoVini near Piazza Santa Croce for lunch. We each tried a different pasta, and everything was delicious, including the house Chianti and dessert of vin santo and biscotti. My post-lunch plan was to check out the Basilica of Santa Croce. I have a thing about churches—I’m not religious, but churches provide heaping servings of history, art and architecture, all in one place—and this particular church is the last resting place of famous Florentines like Michelangelo, Galileo and Machiavelli. But it turns out that Santa Croce is one of those many sights in Florence that charges a (hefty) fee to enter, so we gave it a pass. But here’s the beautiful facade! The rest of our afternoon was covered by a plan we made just this morning, a pizza-making class. It was a fun activity for all ages, and a great way to make memories—and our dinner. Molly and some other kids also got to help the chef make gelato, so Molly not only made her own dinner, she helped make her gelato of the day (chocolate, for those keeping score at home). After class, we stopped at Mercato Centrale, Florence’s giant public market. The downstairs area—presumably the fresh market—was closed, but the upstairs level offered a wide range of food venues, much like the public markets that are (finally) taking off in the U.S. (Denver just opened its fourth). Finally, we visited Eataly, a large store that was like a mini version of the public market: all manner of Italian groceries, prepared foods to eat there or on the go, and a bar/restaurant. Back at our apartment, we finished the day with a bottle of prosecco, some pecorino we bought at Mercato Centrale and bread from Eataly—because apparently we didn’t get enough cheese and bread from pizza class. Today was the first of two travel days of our trip (Venice to Florence). It also turned out to be an impromptu but necessary rest day, so this won’t be the most exciting update. We took the vaporetto one last time from our Venice apartment to the train station, allowing me to capture this photo that illustrates the city’s perennial struggle against the Adriatic. We rode a high-speed Italo train to Florence, and it had to be the smoothest train ride I’ve ever experienced—so smooth that I couldn’t even tell when we started moving unless I looked. And smooth enough that we all (minus Molly) took naps at various points. After dropping off bags at our Florence Airbnb apartment, we were starving (or at least I was). So our first stop was All’Antico Vinaio, home of the supposed best sandwich in Florence, at the recommendation of my nephew Collin. We had La Summer, the most popular ‘wich: prosciutto, mozzarella, basil and tomatoes on ciabatta—all ingredients unbelievably fresh. It was a day that ended in “y,” so it was time for gelato. This time, Grammy Carol joined in. We then walked off the calories and sampled some of the sights we’ll explore in more depth tomorrow—but despite the earlier naps, we didn’t last long. We returned to the apartment before 6 PM, and everyone (again, except Molly) fell asleep on the couch. And here we remained; after going strong since Friday, we decided a rest day (what was left of it, anyway) was just what we needed. P.S. Happy Fathers Day to me! Every child loves to chase pigeons, and Molly is no different. But she’s been truly possessed by “pigeon-mania” (her words) here in Venice. The flying rats on St. Mark’s Square will be happy to see us leave. Our two main sightseeing goals for today were St. Mark’s Cathedral and the Doge’s Palace. I can share some historical context—St. Mark’s was built in the 11th century; the palace of the Doge (Duke) was the seat of power for all of Europe for 400 years—but as it turned out, today was really all about ceilings. Truly, we spent more time today looking up than looking around. While the walls of the two sites (and the nearby Correr Museum) were decorated, the ceilings stole the show. Especially in the Doge’s Palace, where virtually every ceiling in every room was a gilded masterpiece by Tintoretto or some other master. See the photo above in which Molly stands with arms raised? That’s the Hall of the Grand Council (which can hold 2.600 people). The far wall is Tintoretto’s “monsterpiece,” Paradise, the largest oil painting in the world. Truly, one could spend an entire day (or more) studying and interpreting the countless paintings; for us, it was almost overwhelming. The visit to the Doge’s Palace also gave us an insider’s look from the Bridge of Sighs (the bridge that leads from the palace to the prison, where prisoners got one last glimpse of Venice and sighed with regret). Molly had my phone at the time, and I found this photo later, composed and shot all by her; I think we have a budding photographer in the family. 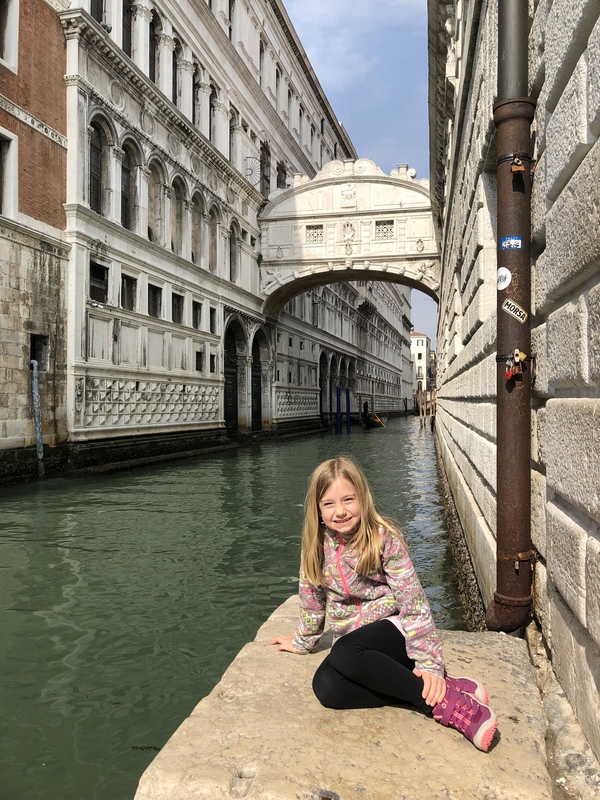 …while Molly and I enjoyed the gelato of the day (despite cold and rainy weather) and saw the outside (and inside, where we warmed up) of the Santa Maria della Salute Church. It’s our last night in Venice, so of course we had to have one more meal of cicchetti, the small bites that are so popular here. So long, Venice. Next stop, Tuscany! Venice is an island, so I guess you could say we’ve been on island time since arriving. But today, we took the vaporetto (water bus) to a couple of islands off of Venice: Cimitero di San Michele (Venice’s cemetery) and Murano (known for its glass-making). You’d be forgiven for perhaps mistaking Cimitero for Gilligan’s Island from afar. However, its residents are in for a tour much longer than three hours. As you can imagine, a city built entirely on the water—and very densely so—offers no room for mortal remains. So Venice has an entire “island of the dead.” The whole island of Cimitero is, as the name gives away, a cemetery. And a gorgeous one at that. As some of you know, I am a major fan of cemeteries (for the millions of untold stories they contain), and this one was worth the visit. Next stop (literally) was the island of Murano, famous for its glassblowing studios (not for manufacturing Nissan automobiles). This canal, Murano’s “main street,” was entirely lined by glass shops (and the occasional restaurant to feed hungry shoppers). We soon became hungry shoppers ourselves, so we grabbed a canalside table for a picturesque and delicious lunch of cicchetti (small bites, Venice’s version of tapas). I tried sarde en saor (sweet and sour sardines with onions), a dish all the guidebooks called a Venetian specialty (good, but not something I’d feel compelled to order again). Back on the “mainland,” we followed the advice of our travel guru Rick Steves, who suggests that gondola rides are a cliche worth the splurge. While the half-hour ride seemed to last five minutes, I’d have to agree with Signore Steves; we definitely made some lifelong memories during that short ride. As my father hinted at, watch for these photos in our Christmas card this year. After a day in which my Fitbit tracked more than 20,000 steps (a personal record), we definitely earned some treats: the second of Molly’s daily gelatos, and a night out for mommy and daddy to enjoy some Italian birra artiginale (craft beer). We are in Venice, and it really is amazing. I’m writing this with maybe two or three hours of sleep under my belt from the past day of travel. Molly is in bed, but when I just checked, Cassie—who went in there to put Molly to sleep—was asleep next to her while Molly was still awake. I’ll be there myself as soon as I scratch out this report. We flew out last night after a stressful couple of days wondering whether the fast and furious “bomb cyclone” that hit Denver would hold us back. But after all that drama, it was just about the most mundane trip possible: no real delays or issues of any kind, despite a short connection in Frankfurt and a series of planes, trains, automobiles and boats to get here. But it was 14 hours of travel, all told, so I won’t call it easy. The city of Venice is an island, but many people arriving at the airport still take a bus across a causeway to get there. We thought it would be more unique to arrive by boat, though, since watercraft are such an integral part of life in Venice. So instead of walking out of the airport and into a bus, taxi or car, we stepped out and onto a ferry! While many of the windows were caked with salt, we were still able to glimpse enough of Venice to whet our appetites. Upon arrival at the Rialto stop, we met our Airbnb host, who kindly walked us to the flat (because otherwise it would have been impossible to find). After getting settled in, we were sorely tempted to just crash hard, but we made ourselves get out and do some early exploring. And of course eat some uber-fresh pasta.